Erin Lakenen works full time at B&B Electric Inc. in Iron Mountain, Michigan. 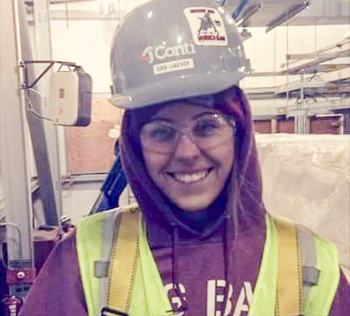 At just 22, the third-year apprentice electrician already owns her own home, and is an example of the benefits available to young women who pursue career opportunities in the skilled trades.Apprenticeship as a career path was a natural fit for the Marquette native. Erin has learned different methods of electrical installation in the industrial, commercial, and residential electrical industries, and she loves every minute of it. She also enjoys participating in career fairs and trade conferences to help other women see that opportunities for good-paying jobs are available to everyone. “I am proud to represent women in a nontraditional workplace and show that there are no barriers women cannot overcome in the trades,” Erin said. The five-year electrical apprenticeship run by the International Brotherhood of Electrical Workers Local Union 906 includes 8,000 hours of on-the-job training and 1,000 hours of instructional learning. After completing the program and passing a state electrical exam, Erin will receive an industry-issued, nationally recognized journeyman certificate. Electricians in Michigan can expect to earn about $57,000 per year on average according to the Bureau of Labor Statistics. There are more than 500,000 apprenticeships across the country, with more opportunities added every day. Find a program or learn how to sponsor one at www.dol.gov/apprenticeship. Editor’s note: Erin's story is one example of an effective workforce program in action. View more success stories here. Post provided by the Departmnet of Labor and written by Scott Allen, Director of the U.S. Department of Labor’s Office of Public Affairs in Chicago.